The Reverie (Common translation: Remembrance) is hardly what many people would consider a ‘ship’; it is more akin to a boat for a larger craft much like a flitter or a mosquito. It indeed looks like an enlarged flitter, big enough to carry multiple crewmen while not being large enough to be considered a true ship. The Remembrance is an elven stinger, an ancient design from the earliest days of elven exploration. The stinger is rarely seen today, usually confined to elven-dominated spheres such as Darnannon. It is too lightly armed and armored for most captains’ tastes. Some stingers are used by couriers for long-distance message delivery between elven colonies and Armada, but little else. The Remembrance looks like an oversized flitter, with a black body and wings, with cobalt-blue highlights. 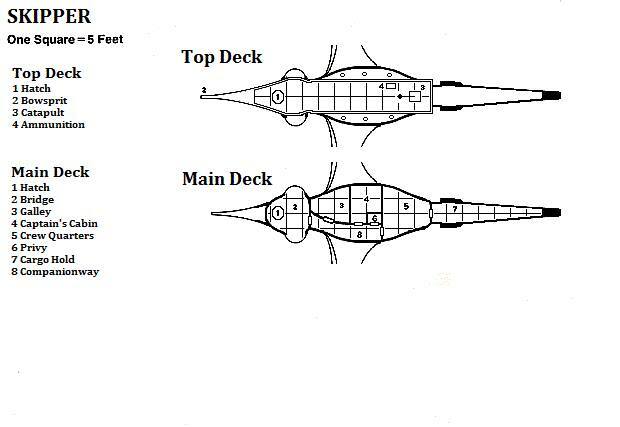 There is a single interior deck and a small top deck. There is only one weapon, a light catapult set to fire at pursuing ships. The Remembrance is not designed for battle, and would be easily defeated by anything more powerful than a dragonfly. Hatch: The hatch to the main deck can be bolted from the inside. Bowsprit: A small Continual Light Lantern that sheds a soft light down upon the deck is located here. The light shed by the lantern is about as bright as a full moon. Catapult: The Remembrance’s only armament, a light catapult, is set to fire in a rear-ward arc. It is movable such that it could be fired in any arc, but this requires a good deal of muscle and takes about five minutes. Ammunition: This crate is bolted to the deck. It holds eighteen round stones that weigh about forty pounds each (ammunition for the catapult). The crate has a simple latch to keep the lid closed, but otherwise is unlocked. Hatch: The hatch to the top deck can be bolted from here. A ladder leads up to the top deck. Bridge: The Bridge of the Remembrance is fairly bare. There is a simple mapping table with charts to about half a dozen spheres (none Steelspace) and a Telescope of Planetary Location. The Telescope is a primitive version of the Planetary Locator. When a person gazes through the telescope, it directs the viewer towards the nearest planet of size A or larger, and shows the viewer a fuzzy image of the planet and a general distance in days of travel. Once per day, the viewer can view another planet so long as he knows the generally accepted name of the planet. There is also a pair of chairs in front of the windows for stargazing. Galley: The Remembrance’s galley is fairly advanced, thanks to an upgrade by Gistor before he died. There is a small, magical stove that can be commanded to become very hot three times per day, enough to prepare a simple meal. There are four barrels in this room (grog, apples, citrus fruit, and salted pork), several sacks of flour, and the usual pots, pans, skillets, and knives to prepare a meal. The Remembrance usually carries enough food to keep the crew fed for four months. Captain’s Cabin: The captain’s cabin has been claimed by Griim. It has a long bed, specially built to accommodate Griim’s eight-foot tall frame. There is also a writing desk, a trunk of clothes, and a small coffer with 500 gp in various currencies (to pay for docking fees). There is also a bookshelf with more than a dozen books written by Griim on life in the Known Spheres. These books detail the people and cultures he has encountered, with little attention to defenses or battle-readiness of non-ogres. As such they are completely useless to the ogres of Steelspace. Crew Quarters: The four-man crew shares this room. There are four hammocks and four sea chests for the crews’ belongings. A silk screen decorated with an oriental-style dragon is in one corner, to allow Sakka some privacy when she changes. There is a writing desk and more than two dozen books on a shelf, all detailing life in the Known Spheres. There is a small table with a drawer that contains dozens of colorful ceramic tiles – useful for play Mahjong and Go! Griim and Krosh often play against one another; when sailing in deep space, their games can last hours. Privy: This tiny cubby of a room has a Chamber Pot of Devouring and Cleanliness (a magically enchanted chamber pot that not only disposes of waste but also cleans the backside with a spray of water and hot air) and an Incense Burner of Neverending Delightful Scents (Jasmine-scented). Cargo Hold: The cargo hold of the Remembrance is quite small, only capable of holding small amounts of cargo. Companionway: The companionway is lit by two small glowing globes, both putting off light equal to moonlight. They can be shuttered to show no light at all. This Month’s Poll: What’s the Most Interesting Spelljammer War?